Getting as far as we legally could north in Myanmar, to a place in the mountains called Arum, it was forbidden to explore any further, and the military made sure of this. However, one early morning we decided to sneak out of town and explore the neighbouring mountains, where after several hours of trekking we came across a little village situated right on top of a hilltop. The entire village came to a standstill when we wandered through, as if they hadn’t seen caucasians before (the vast majority would not have). It was a really cultural experience and they were just the most friendly and accommodating people. Among other things that day, we stared in the opening photograph of a local democratic building (Myanmar people are hugely oppressed, sadly), and then were invited into a funeral reception to celebrate a loved ones life. Later that day we also were invited by a young girl that had been showing us around, to stay with her family that evening, in which we did. 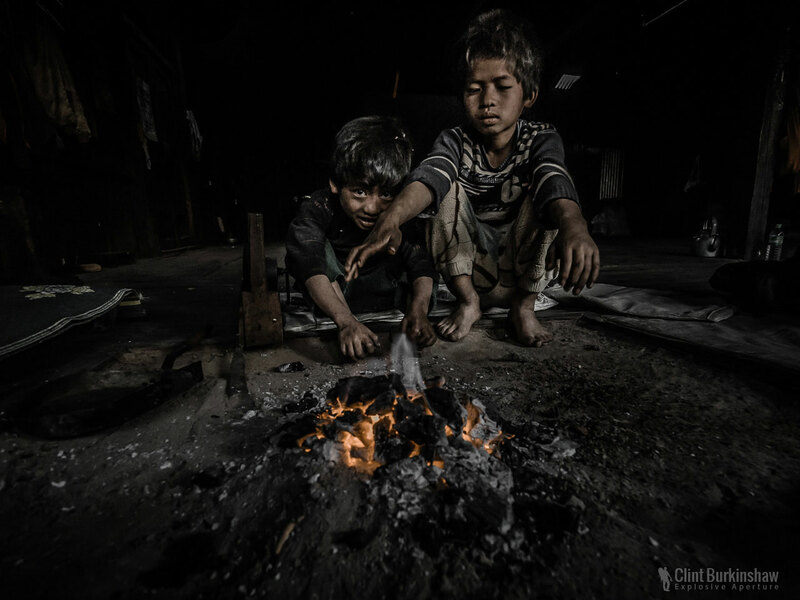 This photograph is of two children within that family we stayed with, warming up inside by the fire as night drew in. We were made a very big special dinner by “Grandma” that evening, just for her new guests (us). Filling our bellies up, we then slept on a couple of blankets next to this fire for the night. The most amazing takes . Thanks so much for your kind words. Glad you’re enjoying the photos! !